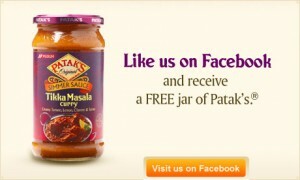 Get a free jar of Patak’s Authentic Indian Cuisine. Go to the Facebook site, and click like. Then, go to the side column and click on “Promotions.” There is a link to get your free jar, and a contest to enter. This entry was posted in Free Stuff and tagged coupons, free stuff, freebies, samples. Bookmark the permalink. Thanks! We love Indian food!